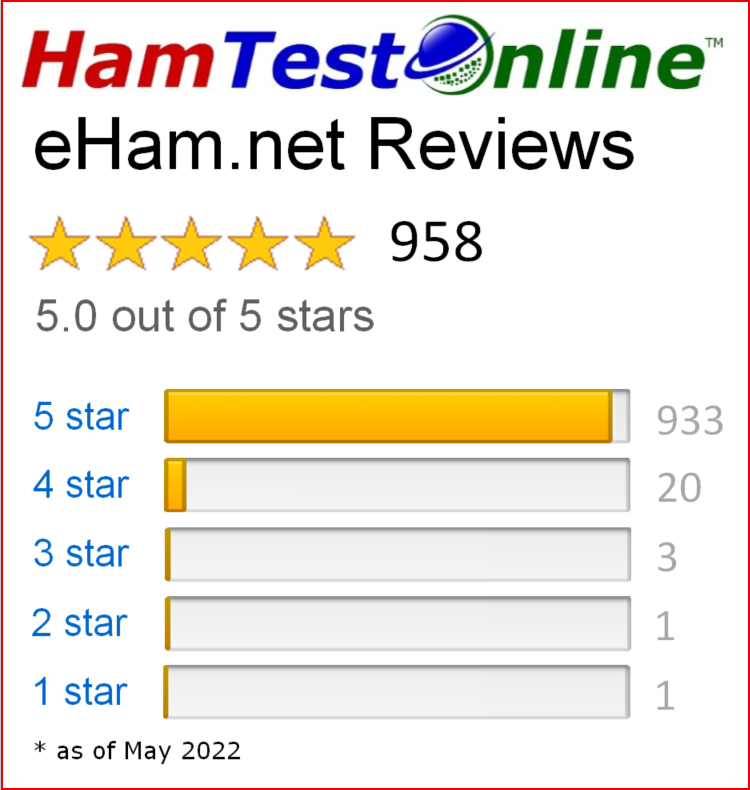 Why the HamTestOnline™ FREE ham radio practice exams are the best! Remembers your answers. You can go back and review the questions you missed on earlier practice exams, even weeks or months later! Resume exam already in progress. If you don't finish the exam one day, you can resume it in your next study session. Immediate feedback. Not knowing your score until the end more closely simulates the actual exam, but immediate feedback is better for remembering. If you goal is to learn the answers, you need the feedback while the question is still fresh in your mind. Ease of use. You will be answering thousands of questions, so you want it to be quick and easy. While other sites make you click inside a tiny circle, we let you click anywhere on the answer text, a much larger and easier target area. Also, one click on our site gives feedback and automatically brings up the next question. Some sites require two or three clicks. Color-coded question pools. You can view the entire question pool, with each question color-coded to show whether you've seen it and how well you have learned it. Or you can display just certain questions, for example the unseen and weak ones. Always up-to-date. The question pools frequently change, and some sites are currently running out-of-date question pools! Integrated into study mode. Our intelligent repetition algorithm treats answers on practice exams the same as study mode, which helps us to focus on your weak areas and make sure you learn everything. Our subscribers have access to advanced features, including focus exams, exams on selected topics, exams limited to then most-frequently-missed and/or most-frequently-asked questions, etc. Of course, we think practice exams should only be a small component of your education. While it is possible to memorize the answers by taking dozens of practice exams, you don't actually learn much that way. For example, they help you memorize the answer of 20 volts, but they don't teach you the formula to calculate the answer. If you're going to invest all those hours studying, you want to learn something about your hobby, so we hope you will first take our online courses and actually learn the materials. Once you have mastered the materials, you might take a couple of practice exams to boost your confidence before the real test. At that point just remember, ours are the best!